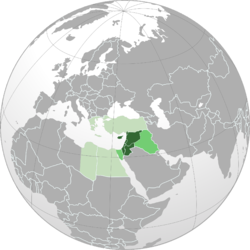 Wikimedians of the Levant (Arabic: ويكيميديا بلاد الشام) is the Wikimedia user group to promoting Wikimedia projects and other projects of free content and access to knowledge in Levant Region (Jordan, Lebanon, Palestine and Syria). It was recognized on May 20, 2015. See the category on Wikimedia Commons for more information. Each of the Levant countries has a few contributors and this makes it difficult to establish individual groups. The noticeable similarities of the Levant countries in terms of the language, history, culture, geography and lifestyle. Users and contributors of these countries share similar interests, challenges, needs and they participate in the same Wikipedias and projects. Hence, it would be great if their efforts were unified under one group through which challenges could be overcome, needs fulfilled and projects and interests better organized. To unify the work needed to participate successfully in different projects (e.g. Wiki Loves Monuments) in terms of performing the official tasks, providing guidance, boosting participation, deriving local contests, sharing experience and ideas, etc. To coordinate the work and consultation related to participation in the international events such as Wikimania and regional events such as WikiArabia. Representing the Wikimedia in the Levant and gathering the Arab contributors of the Levant countries in one group. Establishing a base and a reference for all Jordanians, Palestinians, Syrians and Lebanese in Wikipedia and all other wikimedia projects. Promoting and developing the content related to Levant countries specifically and the Arab World generally in different languages. Organizing activities, gatherings, workshops and different projects for contributors of the mentioned countries so it saves efforts and cost. Unifying the efforts of the contributors under one umbrella, especially those with technical skills. Gathering the contributors who live abroad and have them put some focus and efforts in enhancing the Arabic content, especially what's related to the Levant. Unifying the contribution in the international activities, such as Wiki Love… contests and others. Developing a performance plan for ambassadors to represent Wikipedia in the Levant universities, taking into consideration that Jordanian and Palestinian Education Programs can be used as a platform to start. This page was last edited on 17 April 2019, at 14:37.